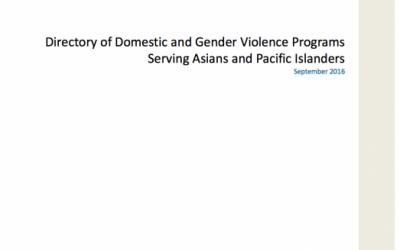 The A-Z Advocacy Model for Asian & Pacific Islander Survivors is defined by the nexus of an extraordinary inventory of evidence-informed practices in response to existing and new trends in gender-based violence and inter-and intra-API cultural and linguistic diversity. It is anchored in principles that analyze gendered and racialized cultural contexts, confront root causes, engage in systems change and cultural transformation; all the while, holding women’s equality and empowerment central to community well-being. The A-Z Inventory of Practice and qualitative and quantitative data show how culturally-specific advocacy is operationalized. An analysis of intersectionality and patriarchy deepens the understanding of root causes and becomes fundamental to program design. An analysis of how power, equality and empowerment are compromised by the intersectionality of oppressions, including patriarchy, is fundamental to the A-Z Advocacy Model. Confronting root causes and building culturally-specific interventions are intertwined in the A-Z Advocacy Model. Culturally-specific programming means designing services that address ethnic and linguistic diversity within and among Asians and Pacific Islanders. Expanding language services to match the changing needs of ethnic communities, in some cases even beyond the original target population, is a principle of the A-Z Advocacy Model. Providing language access, often for multiple API and non-API languages is a principle of the A-Z Advocacy Model. Survivor-centered advocacy is based on a culturally-specific analysis and definition of domestic and family violence. Broadening the definition and analyzing the differing dynamics of domestic violence in API families is a principle of the A-Z Advocacy Model. Integrating an analysis of, and responses to, gender-based violence when working with API survivors of domestic violence became evidence-informed practice. Broadening domestic violence services to address gender-based violence over the lifecourse is a survivor-centered advocacy principle of the A-Z Advocacy Model. Engaging in systems advocacy builds gateways to services through collaboration, policy advocacy, and research. Institutionalizing systems advocacy to mitigate system barriers is a principle of the A-Z Advocacy Model. Taking leadership on systems advocacy to mitigate language access barriers for all survivors with limited English proficiency is a principle of the A-Z Advocacy Model. Integrating tools for economic security is a growing component of the A-Z Advocacy Model. Policy advocacy on behalf of Asian (and other) immigrant survivors is a core organizing principle for systems advocacy in the A-Z Advocacy Model. Research to establish need and analyze context is a strategy for systems advocacy in the A-Z Advocacy Model. Unique collaborations to promote systems advocacy for immigrant survivors unfamiliar with systems in the U.S. is a principle of the A-Z Advocacy Model.